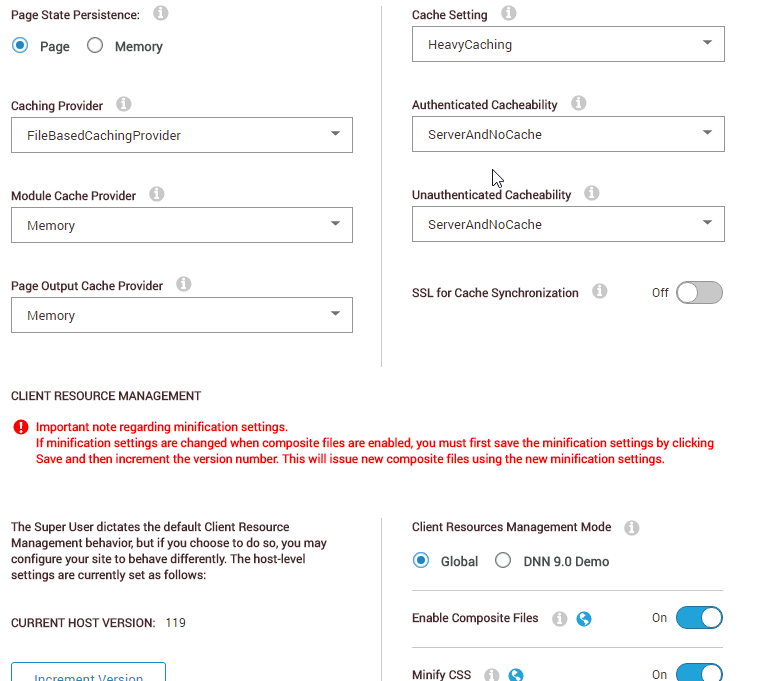 With the recent release of DNN Platform version 9.0.0 & 9.0.1 I have been an increase in the requests for updates to my prior guides on locating the important performance settings since everything has moved to different locations. A major overhaul of my Performance Whitepaper is underway, however, I wanted to take a little bit of time to run through key settings for those new to 9.x. Consider this a high-level walkthrough of key concern areas. We will start our overview with items now associated with a "Server" configuration. These items include many of the items that historically would have been found under the "Host Settings" section in prior versions of DNN/Evoq; screenshot included below. All of the important settings are included under the "Performance" tab. All of the same rules that have applied in the past, still apply today. It is recommended, when server resources allow, to use the Memory options for all providers. (Except Page State Persistence which should ALWAYS be "page"). It is important to select "HeavyCaching" for the Cache setting for the best performance possible in your installation. At the bottom of this tab is where you can turn Client Resources Management (CRM) on, or off. This setting is disabled by default; however, it is recommended that you enable this if supported by your skins and modules. It is important to notice that you will now see a new "Mode" option on this section. Allowing management of CRM by the installation (global) or portal. This is where "Host Settings" -> "Scheduler" has moved. The default jobs are all the same. Installations should have the Timer mode enabled already, the only concern settings wise here for performance is the frequency of any installed jobs. One of the settings that is often the hardest for individuals to find as part of the installation are the settings to disable upgrade checks as well as to participate, or not, in the improvement program. These settings can be found under Site Settings, in the Site Behavior tab, and the "More" options. As of the writing of this post, two configuration options that we recommend updating no longer have interfaces for changing the values. However, they may be updated with a simple database query. These settings include the enabling of the EventLogBuffer, for improved performance on error writing, and the removal of DNN Copyright credits. I expect future releases to add these functionalities back, however, until that is possible the following script will update these two settings for you. Settings and configuration are very easy to change in DNN 9.x, things simply moved around a bit. I hope this quick overview of performance settings for 9.x has been helpful. Share any questions, comments, concerns below.